Today, we are taking a look at some GeekBench scores that show what the Samsung Galaxy S9+ is capable of. Well, at least the Snapdragon variant. The S9+ is expected to ship with the latest Qualcomm Snapdragon 845 chipset. The model number in the Benchmark results is SM-G965U1, which corresponds to the larger S9 model just as the Galaxy S8+ and Galaxy S7 edge both had model numbers that ended in “5”. The “U” signifies an unlocked model, in this case for the US. The single-core score gets a noticeable bump over the Snapdragon 835’s of about 27% while the multicore score gets a 31% bump in scores over the 835. These numbers are quite high, but they still don’t beat the iPhone X’s A11 Bionic chip. Still, at the end of the day scores are just numbers and what matters more is real-life performance. 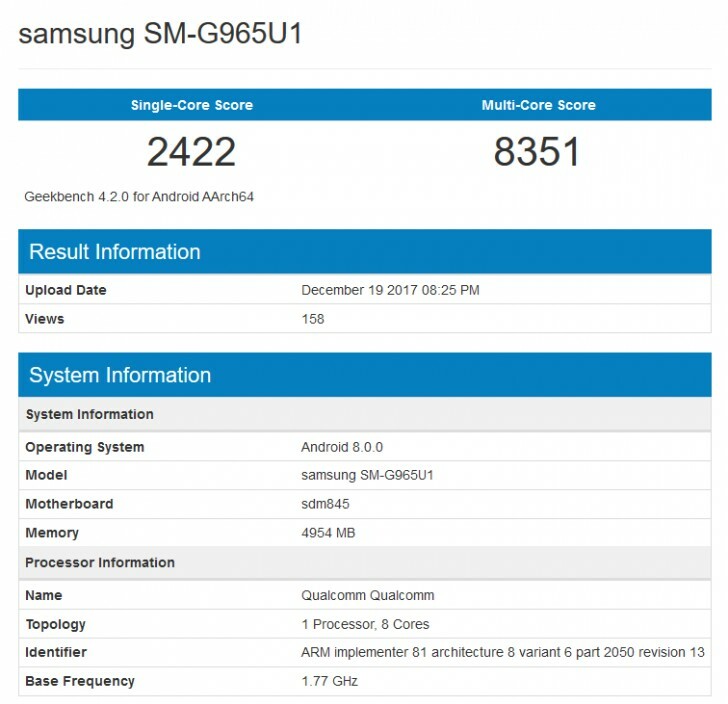 Philosophical thoughts about benchmarks aside, the GeekBench result also shows 5GB of RAM on the S9+. We’ve heard that the two models might have different amounts of RAM onboard, the smaller one 4GB while the larger one would have 6GB. It looks like that may be the case here. Keep in mind that benchmark apps oftentimes misinterpret specs, so we wouldn’t bet the S9+ will actually have 5GB of RAM. Finally, the Galaxy S9+ spotted here is running Android 8.0 Oreo. We really hope that with Google’s Treble, Samsung will not take eons to update its flagship devices to the latest version of Android. This is supposed to become the standard for smartphone launched with Android Oreo. Aside from the RAM, the Galaxy S9 and S9+ will have two different camera setups, a single cam on the S9 and a dual-camera on the S9+. Otherwise, the phones are expected to have slightly smaller top and lower bezels and a repositioned fingerprint scanner below the camera(s) as opposed to next to them. We are anticipating the announcement and launch of the Samsung Galaxy S9 and S9+ to take place sometime during the first couple of months of 2018. Yesterday’s leaks of the phones’ hardware have made it hard to imagine anything else. Clicking battle? Whose? Point me to these youtubers.